VA Form 10-0436 or the "Application For An Off-site Tissue Banking Waiver At A Non-profit Or Academic Institution" is a form issued by the United States Department of Veterans Affairs. The form was last revised on January 1, 2011 - an up-to-date fillable PDF VA Form 10-0436 down below or find it on the Veterans Affairs Forms website. Research Office. The Research Office should forward the application to Kristina Hill in Central Office. help us review your application should be added on page 5 in section 9D. collected under a protocol designed for banking of specimens. biospecimens will not be sent to the company. G1. Are other VA Medical Centers participating in this study? H. Is IRB and R&D Committee approval contingent upon this waiver? C1. Have biospecimens already been sent to the tissue bank named in section 5 above? C2. Are the biospecimens being banked at the VA until the off-site tissue bank is approved? E1. Will all future uses of VA biospecimens be done through VA-approved protocols? 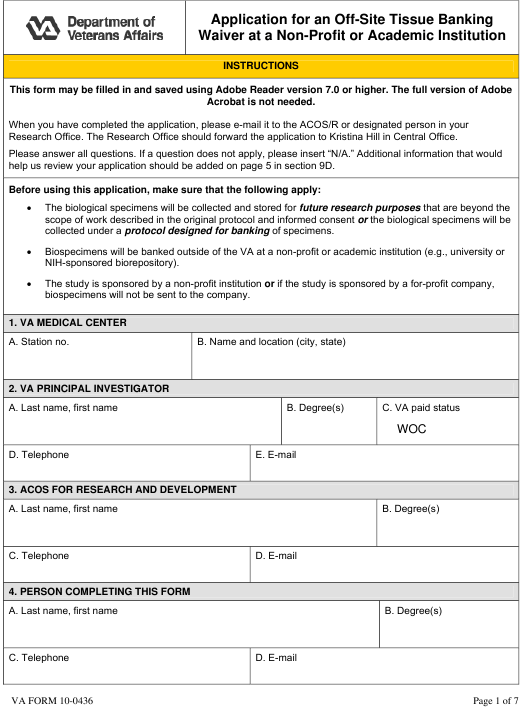 biospecimens to researchers, including a description of the oversight. or anything derived from the 18 HIPAA identifiers listed on page 6. H2. Are any of the people who have access to the key outside of the VA? transferred in a secure manner. Indicate how the data will be transferred (VPN, encrypted e-mail). A. Provide the justification for banking biospecimens at a non-VA repository. B. Upon termination/closing of the bank, what will happen to veterans’ biospecimens? Biospecimens will be returned to the originating VA facility. Other. Please provide an explanation. C. If the subject withdraws from a study, what will happen to his/her biospecimens and data? Biospecimens and all data linked to that subject will be destroyed.